Michiyasu Fujisaki holds a photograph of the student baseball team he belonged to at the Aisei-en sanatorium in Setouchi, Okayama Prefecture. The Asahi Shimbun August 20, 2018 - For Michiyasu Fujisaki, being diagnosed with Hansen's disease, or leprosy, at age 8 in the 1950s meant that he had to live in sanatoriums under the segregation laws in Japan in effect at the time. However, the disease did not dampen his love of baseball, as well as other youngsters he was housed with at Aisei-en, a nation-run sanatorium built on the island of Nagashima in Setouchi, Okayama Prefecture, western Japan. Under the segregation policy of the time, his school baseball team within the sanatorium could not visit other schools to play friendly games, and even school trips were not allowed for the students. 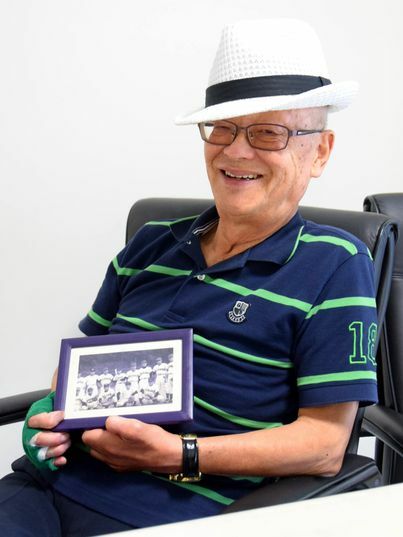 While playing at the Koshien stadium for the national high school baseball tournament was out of the question, Fujisaki and other rebellious teammates from the sanatorium embarked on a "field of dreams" trip in 1960. “If we cannot go on school trips, let’s hold some sort of event instead,” another baseball club member suggested when Fujisaki was in his second year at the school. “I want to play some games away from the sanatorium,” others said. Ten club members, who were fit enough to travel, including Fujisaki, decided to go on an unapproved “tour” of other sanatoriums in eastern Japan. Fujisaki, 75, originally from Akita, northern Japan, always loved baseball. He was diagnosed with Hansen’s disease and was taken in to a sanatorium in Aomori in 1952. In 1953, live TV coverage of the National High School Baseball Championship started airing. In his early teens, the disease affected his finger joints of both hands but he continued playing baseball at the sanatorium. The times were difficult for leprosy patients. Despite leprosy became curable in Japan in the late 1940s, segregation laws for the disease were enacted in 1953, and authorities forced leprosy patients to live in sanatoriums across the nation. In 1955, the Niirada school was opened within Aisei-en. It was the one and the only high school ever set up within the 13 national sanatoriums in Japan. It was founded as an annex of the prefecture-run Oku High School and offered four-year part-time courses. One year it had only one class with a maximum student number of 30 per year. The establishment of a high school, which is not covered by compulsory education, within a leprosy sanatorium itself was the accomplishment of a resident group’s movement at Aisei-en to recoup freedom and human rights for younger patients. Through a competitive selection process, young patients were admitted to the school and transferred to the island from other sanatoriums around the country in the hopes for future higher education or finding employment in wider society. In 1959, Fujisaki entered the Niirada school as the fifth class of students since its opening and joined a student baseball team that used a rubber ball. There were about 20 to 30 players on the team, and they would play games on Sundays against the adult resident team of Aisei-en and other outside adult teams visiting the sanatorium. Fujisaki said he was a fleet-footed, lead-off hitter. As the leprosy patients at sanatoriums were not allowed to go out without special permission, Fujisaki and the 9 other players made up false excuses, such as a family member falling ill, and asked permission for temporary home visits during the summer holidays in August 1960. The 10 left the island separately with only their baseball uniforms and gear tucked in their bags, then joined up at Okayama Station to go on the expedition. They visited sanatoriums in Tokyo and Shizuoka, Gunma, Miyagi and Aomori prefectures by train and on foot, to play against teams of residents and sanatorium staff. During their tour, their plan was found out by Aisei-en officials, and a prompt “return order” was circulated to the institutions they were planning to visit. “We will go home after this game,” the 10 kept promising the opposing team, but then would head off to their next destination. At the end of August, they arrived at their final destination in Aomori, the sanatorium where Fujisaki once lived. To that point, the Aisei-en team had won nearly 10 games without a loss. The team defeated the residents' team in Aomori, but the staff team was a well-known baseball powerhouse, having some former high school baseball players and other talent. After the Aisei-en team suffered its first and only loss to the Aomori staff team, the 10 quickly returned to Okayama island before the start of the second semester from September. In a few years after the legendary excursion, the number of new students to the Niirada school rapidly declined as leprosy patient numbers dropped, and the students’ baseball team was disbanded. However, it took another 15 years from Fujisaki and his teammates’ travels until the school's students were officially allowed to embark on school trips from 1975. Most of the 10 who went on the 1960 tour either entered universities or found jobs outside the sanatorium. Fujisaki returned to the sanatorium in Aomori due to his leg condition and family issues. He joined the self-governing body within the sanatorium that campaigned to improve living conditions there. One achievement was the abolishment of “patient labor,” where healthier residents nursed other residents with severe conditions. Fujisaki is currently working as the secretary-general of the National Hansen’s Disease Sanatorium Resident Association. Every summer, he looks forward to watching regional competition and the National High School Baseball Championship at Koshien Stadium. The Niirada school was closed in 1987. According to official records, a total of 397 students studied there over the three decades of operation, and 307 formally graduated. Of the graduates, 225 former residents, more than 70 percent, went on to make a living outside the sanatorium.